The Eno River Association offers hikes each Sunday from January through mid-May and a special hike in June for National Trails Day. Winter Hikes on the Eno: Click here for more information. Spring Hikes on the Eno: Click here for more information. The Eno River Association hosts its own series of Hikes and Outings to bring all the citizens of the Eno to the river to enjoy, explore, and learn more about the places we love. Most hikes and outings take place on Sunday afternoons from 2-4:30 and more details can be found by checking the calendar at enoriver.org for the most up to date information. 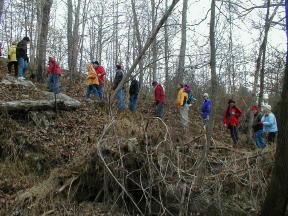 New Year’s Day Hike A tradition since 1971 of the Eno River Association is our popular New Year’s Day Hike. We gather together as one Eno family and take either a short, family-friendly hike or a longer, more adventurous one at the Eno River State Park. Start the year off right and join us to celebrate another great year on the Eno. Click here to learn more about our New Year’s Day Hike. January and February find us leading a hike every Sunday afternoon to explore a new area of the river. We see, hear, touch, and learn about the natural world as well as the history of the Eno River basin. Click here to learn more about our hikes in January and February. March, April and May continue our treks up and down the Eno River and some hikes will feature spring wildflowers, while others simply enjoy the beauty and history of the river. The last hike of the season takes place on Mother’s Day with a hike up Occoneechee Mountain. Click here to learn more about our hikes in March, April and May.